Harajuku girl with purple hair wearing a faux fur coat, plaid pants, vinyl record bag and platform boots. Harajuku student with frosted hair and round glasses wearing a bomber jacket and midi skirt with platform sandals. Harajuku girl in a blue sunflowers print yukata with wooden sandals and colorful braids. 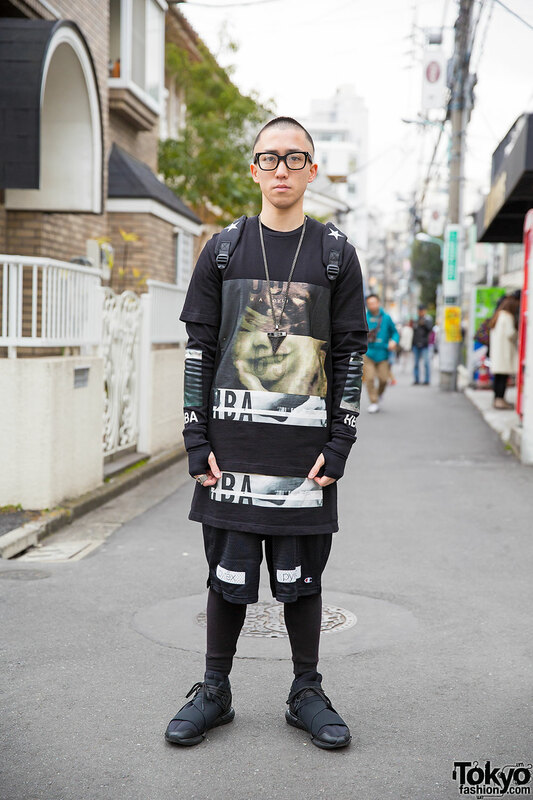 Harajuku guy with glasses wearing a long t-shirt, shorts over leggings, a black panther backpack, metallic necklace and ring and canvas shoes. Harajuku girl with beret, colorblock sweater, printed coat, leggings, backpack, circle scarf and ankle boots vs. guy in cap, sunglasses, bomber jacket, jeans, necklace and sneakers. Models in Harajuku wearing mini skirts and shorts, with dyed hair, high heels, colored contacts and cute hairstyles. Blonde girl with glasses, wearing colorblock maxi knit dress and lace-up boots in Harajuku. Two models in Harajuku, one with cutout top and ripped garter jeans, the other in blonde twin tails, plaid blazer and ankle boots. Harajuku girl in little black dress with menswear denim jacket, cap, bucket bag and heeled sandals.